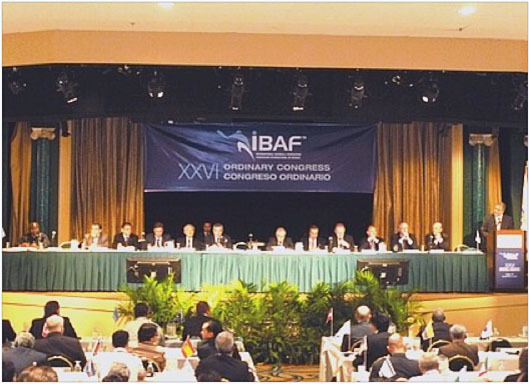 Dallas (Texas-USA) After the role call, IBAF Secretary General Israel Roldan admitted to the Congress the representatives of 63 Federations. The Congress approved the Financial Reports. Treasurer René Laforce reported on the last 2 years: "The main reasons that helped the IBAF through this difficult period are the cuts made on expense side and the fee received for the World Cup in Panama". Laforce added that the situation at the end of 2011 would be "Extremely serious" if the IBAF hadn't reached an agreement with Major League Baseball. The IBAF Executive will also work on a project to charge different affiliation fees according to the size and budget of the different Federations. Continental Vice President for Oceania Ron Finlay went through a series of modifications to the Statutes. The IBAF statutes had been approved in 1995 and went through modifications in 1996 and 1999. The main 2011 modifications are about the article 7 of chapter 3. Another modification to the statutes regards the elimination of the sub commissions and the possibility for the Executive to create Permanent Commissions and Ad Hoc Commissions. The fully reviewed statutes will be made available as soon as possible. A very important part of the Congress was the voting of the new scheme of International Tournaments. The Congress voted on 2 different propositions and the one approved offers a totally different perspective to the International schedule, including modifications to the age groups. The World Baseball Classic will be the main tournament sanctioned by the IBAF. The next edition will happen in 2013 and in 2012 will be played the first ever Qualifier. In 2012 the IBAF will also sanction the AAA (18 and under) World Cup (starting 2013 it will become the 18 and Under World Baseball Classic), the AA (that was a 16 and under but will become a 15 and Under tournament) World Cup and the Women World Cup. The IBAF will sanction 2 brand new tournaments: the 21 and Under World Cup in 2014 and the IBAF Premier 12 (a senior tournament involving the best 12 teams of the world) in 2015. The 21 and Under World Cup will happen every other year (as the 15 and Under, the 18 and Under Classic and the Women World Cup), while the Premier 12 will happen every fourth year. "There is still work to do on eligibility rules for the players and we will have to agree on very strict time frames for the tournaments" said President Fraccari "But I am confident we have a great chance to see the revenues rise dramatically". MP&Silva, the IBAF Media Partner introduced at the end of the Congress, does share the same view. The International Media Agency is specialized in Sport TV Rights (and counts on a massive portfolio in soccer and tennis rights) and is particularly strong in the Asian market. MP&Silva management told the delegates that their goal is to increase the visibility of baseball, see the revenues increase and improve brand awareness. Furthermore, MP&Silva will work to link the IBAF to marketing and sponsorship agencies.